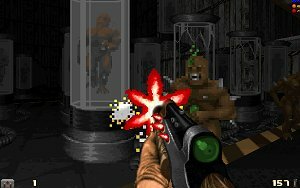 Action DooM is a free FPS PC game that tries to get the 2D shooters feel to a 3D world in the style of Doom. The levels are linear, the gameplay is fast and the shooting is frantic. A sequel, Action Doom 2: Urban Brawl was later released.